Hagar, who split from Van Halen in 1996 and reunited with them to support a greatest hits album on a 2004 tour that ended poorly, has repeatedly bashed the band at every turn since – including recent slams over the group’s 2015 live album and claims that brothers Alex and Eddie Van Halen have been trying to shut down his ability to perform material from his time in the lineup. Following the late 2015/early 2016 deaths of fellow rockers Scott Weiland, Lemmy, David Bowie and Glenn Frey, Hagar tells Oprah that he has found himself in a new place. "The whole Van Halen issue, I really put that behind me, and I'm proud of what we did. So I've decided, forgive and forget,” explains the Red Rocker. “I ain't looking for nothing from nobody. I don't wanna… I ain't asking to be, you know… get back in the band and do all that again; that's work! I don't wanna do that. No, no, no. I just wanna be friends." He adds: "I wanna say I'm sorry of anything I said bad about you." Hagar’s comments to Oprah mirror much of what he told Rolling Stone in March, just weeks after the singer reached out to Eddie Van Halen for the first time in more than a decade in an effort to re-establish a friendship with his former bandmate on the occasion of his 61st birthday in late January. 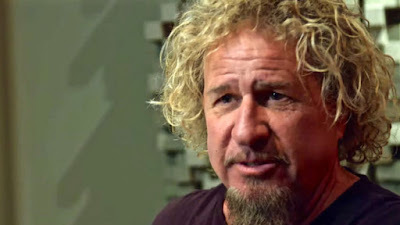 Hagar made headlines with a tweet to the guitar icon, writing “Happy Birthday Eddie - hope you're doing good", which prompted the reply, “Thanks Sammy. Hope you're well too." Supergroup The Circle – which features Hagar, bassist Michael Anthony, drummer Jason Bonham and guitarist Vic Johnson – will return to the road for more US dates starting August 24 in Tulalip, WA. Formed in 2014, the group released their first live DVD, “At Your Service”, last December. This week’s episode of “Oprah: Where Are They Now?” airs Saturday, August 20 at 10 PM, ET/PT on OWN.